Part 3 has a link to a YouTube video of one style of of double knit cast on. Have you grown bored with the Phyllotaxis scarf? I have! I don’t want to post anything else about it but IT IS FINISHED! And I will l finish it --by the end of this week, and then I’ll start something new! Yesterday, I stopped working on the scarf to make a swatch --for the planned hat to match wristlets. 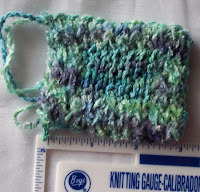 I decided on Linen stitch--a tricolor linen stitch--and swatched. Amazing, isn’t it? Slip Stitch patterns are one of my favorite ways to use color--I learned this stitch 25 34 years ago! 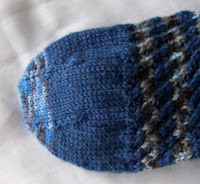 I first used it on baby clothes I knit when pregnant. Back in those day, pre-birth tests (for all sort of things) were very rare. And almost no one new ahead of time whether they were having a boy or girl--so many of the baby clothes I knit were pale (and dark) green, or pale (and bright) yellow or white. And some had all three colors! And one, I clearly remember making, had a yoke of tricolor linen stitch. You’ll have noticed, I am sure, that the swatch is a slight rhombus in shape. I used Long tail, so my first row is a wrong sided row..
Row 2: Drop color B, pick up color C, K1, *bring yarn to forward as if to purl, Slip1, bring yarn back, K1. Repeat from * end row with K1. Row 3: At the completion of row 2, there will be 2 yarn on left edge of work, (color C, from just completed row) and color A. Pick up color A; and P1 *P1, then bring yarn to back, as if to knit, Slip 1, bring yarn forward, repeat from * end with P1. Row 4: At the completion of row 3, there will be 2 yarn on left edge of work, (color A, from just completed row) and color B. Row 5: At the completion of row 4, there will be 2 yarn on left edge of work, (color B, from just completed row) and color C.
Pick up color C; and P1 *P1, then bring yarn to back, as if to knit, Slip 1, bring yarn forward, repeat from * end with P1. Row 6: At the completion of row 5, there will be 2 yarn on left edge of work, (color C, from just completed row) and color A. Basic Linen Stitch is a 2 row pattern, in each row, 1 stitched is worked, 1 slipped, with the bar of yarn from the slip stitch sitting on the front of the work. As each row is started, there will always be 2 strands/colors of yarn, the color just used, and the color dropped 2 rows previously. The Color/strand of yarn dropped previously is always the one that will be used. It looks good in a number of different color selections--high constrast colors look just as good as low contrast. The reverse side looks nothing like the front, but its very attractive, too! The first part of scarf (skein 1) is 16.5 inches long. Skein 2 yielded 17 inches of scarf. Skein 3 yielded 17.75 inches! Now the scarf starts with 10 rounds of garter, and garter rows are tighter than stocking knit rows, so they could account for the difference between skein 1 and skein 2. But almost another inch from skein 3? That is 4 rows of 80 stitches! I haven’t been letting the knitting hang as I knit, it’s not stretching from the sheer weight of the knitting on needle. Note also, I have been using a 29inch circ to work, and have a modified/half magic loop way of knitting. It’s hard to know if my gauge has change slightly, as I knit faster knowing the pattern, or if the yardage of each skein is slightly different --a possibility--or what! With 3 skeins knit, the scarf is now 51 inches long, , with another 16 inches the finished size will be close to 66 long--about 6 inches longer than the pattern suggest. I am pretty much decided on a stitch (tri colored linen) and that I will full the finished hat. I’ve been mentally working out the pattern--it will be knit in 3 pieces, a shaped brim, a gusset, and the crown, but most likely will be knit together as I go, rather than seamed. A classic almost medieval style pill box hat. Sometime today, the US Mail delivered a tyvec envelope with 8 (count’em) 29¢ stamps to an address in the great state of Massachusetts. Inside are 1 pair of socks, (part of the Knitty.com coffeeshop swap) and 2 bonuses. Last October, in part of the great furniture exchange, I received several packets of old stamps. The stamps in some cases had stuck to the little cardboard folders (they kind they used to be packed in--How long ago was it that 1st class postage stamps became, universally, peel and stick? And how long ago was it that 1st class postage was 29cents? Well in any case.. 29*8=$2.32 and the correct postage for the package was $2.31--so 8 stamps did the trick! When making socks for someone else, its hard to know how they will fit.. You can have all the measurements in the world, but fit is fit. So what’s the solution? A special, non boring rib. Last year, (at about this time) I won first prize in a small (VERY, VERY SMALL) fair for a pair of socks with a twisted oblique rib. So I thought I would once again use that pattern. 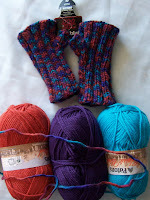 The first socks were in Regia yarn, these new socks were knit in Calizetteria yarn. And the finished look of the first pair is so different than the second, its hard to believe they are basically the same pattern! A second interesting aspect of the swap socks is how much the pattern does for the stripes. The sole (not ribbed, D’oh) looks ho hum. The striped, ribbed leg and instep--WOW. It’s one of the things I love about knitting.. Sometimes I am still surprised by the finished object! I had an idea that I thought would look good, but was startled to find that it didn’t look good, it looks special and unique and just wonderful! And even though the ’knitting’ is just about the same in the yellow sock as in the blue, the finished socks look remarkably different! Followed by a 1 X 1 ribbing for a deep cuff, (1.5 inches) then stripes of solid blue alternated with stripes of blue/lt blue/lt grey/charcoal grey color way. The color changes were short --just 3 to 5 stitches in a single color before changing.. They kind of yarn in my youth that was called variegated. The heel is flap, turned, gusseted style, with a non traditional heel flap stitch, and a square or dutch turning. The twisted oblique ribbing continued down the instep, and the toe was a square toe to match the heel. --see the detail here. The ribbing should provide enough snugness for a good fit--and blues? Well even I still wear denim and blue socks are a natural go with for denim. I was very pleased with how these socks turned out.. I hope the recipient is too. I am still new to blogging--less than 1 year at it, and less than a month since I joined 2 blog rings. I have been going round the rings, and seeing what I like, (and don’t like) about various blogs. 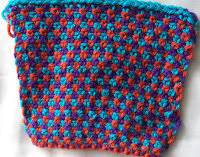 I think buttons Yarn Harlots offers --to link to her bog is cute, as are many others, but some blogs are so cluttered with buttons the side bar has becomes a chore to navigate. I might, eventually make a button for others to post on their blog.. But I don’t want to have buttons and buttons and buttons.. I want to have a single link or two (to hidden lists) --I’d rather mention a specific blog in a post, with a link, than have a meaningless list of hundred blogs or sites. First a list of the 100 favorite books, followed by 100 movies, followed by 100 blog’s, and then by another list of another 100 odd links. Does any one really consistently READ a hundred blog’s? Or do they just glance at them, and read occasionally? There are blog’s I check out on a regular basis, but I skip all the posts about babies, and animals. It’s not that the babies aren’t cute--but I just am not interested in reading paragraph after paragraph about babies, and I am less interested in animals. 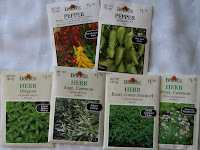 I LOVE blogs with photo’s. WIP, or FO, or UFO, be they knitting or other crafts, or vacation photo’s, or fun images of your wall paper or couch.. Stashes and storage solutions, (or lack there off!) are fun too. Even a photo or two of your daring (be they human or animal!) --Photos are good. Even cliché images of sunsets, snow storms, babies or pets are better than acres and acres of plain text with no images! --Unless the text is a recipe.. I love recipes. All this ring surfing has helped me decide what I like or dislike, and how I want to shape and manage my own blog. I’ve been making small improvements to my blog.. I put up some crumby buttons (better ones are in the works, but these will do for now) to make it easy to find free patterns I have posted, or recipes I have posted. And some more Title Buttons to go along.. But not to many! The plan is for Title Buttons/headers that actually make navigating the side bar easy. As I go round the rings, I find navigating some sites to be frustrating and cumbersome. There is so much information, (calendars, lists, buttons, WIP and On the needle gauges, Knit Along’s, blog rings and what not --though I am attracted to the phases of the moon chart--some have both right and left side bars, crowding the blog text and photo’s like a vise. My goal is to use what I need, but to be somewhat minimalist. Too much information causes overload, and is actually less helpful. Header/Title Buttons are useful--but used to excess, they make as more problems than they solve. I am deciding what I need, headers for Recent posts, for Archives, for Favorite Links (to blog’s /and other sited I find interesting) to Rings and other blog related activities, for Free Patterns (my own), for Technical tips (I haven’t posted any yet.. but…) for Recipes, and for Patterns for sale (again, none yet, but coming soon) as well as a photo gallery link. That is 9 already --I don’t want more than 10.. Ten is plenty! Right now, as a work in progress, the side bar is a mix of styles, Recent, and Archives are ‘fancy script’(a template default) and free patterns and recipes are poorly done bit maps, Links is just plain text.. A real mishmash. I think I want to organize them in alphabetical order too, Archives, then Blog Lists, then For Sale, then Free Patterns, Photogallery links, Rings, Recipes, and ending with Technical tips.--I need to find the font size code, too, since right now, I think the text is too large. and now, I have to get back to my knitting. 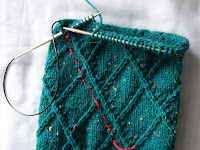 Slowly, but surely, skein 3 is turning from a ball of yarn to inches of knitting. The Orange stitch marker is round 1, the turquoise one marks the beginning of skein 3--the half way point--(both markers are just visible on left side of image) and while the skein still looks big and fluffy, it’s a hollow remnant of itself.. I am about 12 inches ‘into’ the skein --each skein yields about 16 inches of knitting. I haven’t spoken of yarn-- it was from my stash --I am using 4 (of 10) balls of Lion Brand Wool Ease that I purchased at Smiley’s Yarn in Queens (a few years ago!) --so naturally it’s a discontinued color/style. The 10 pack (the yarn was only available as a ten pack) was $10. It’s called Hunter Green Speckle. I am pretty certain I will make the Phyllotaxis Tam/hat as well, from the same yarn. I am itching to have it finished, and while I have knit enough, that I have earned the right to take a short break, and knit something else, (like the hat to match the wristlets!) I haven’t decided on stitch/style for the multicolor hat, (except: not simple stripes!) so I’ll continue on the Phyllo scarf and think and know, I can, if I so chose, stop for long enough to knit a hat. I am thinking of a slip stitch pattern, but then again, maybe colored cables, or something in fair isle. Eventually I will settle on one of these options.. Or come up with another! Now that I know the pattern, Phyllotaxis has settled into being just another boring scarf to knit. Oh well. Friday (normally a knitting day for me) I got a good 6 inches done. Since then, a scant 6 inches more! The small stitch markers are at the “new Ball of yarn” joins, and measure progress (or lack there of! )-Early Friday, I posted with some 9 inches past the first maker, 11 PM Friday, I added an edit when I joined on a new ball of yarn. Here I am Tuesday, with less progress in 3 days than I made in 1! To give myself a break from the monotony of a memorized pattern, yesterday I made a pair of wristlets from some bulky yarn that knit up in minutes. I love the colors in this Anny Blatt, and 2 skeins (all I had) made these, and left me with some 15 to 20 yards of yarn left over in each skein. 30 yo 40 yards is really not enough to do anything with--except perhaps trim a hat or scarf.. --and I doubt I will embark on another scarf immediately! A hat is possibility. My stash has Paton’s Classic Merino (1 full and 2 partial skeins) in colors that closely match this yarn. So there is a real possibility of a co-coordinating hat appearing. But --will pace and reward myself--No hat until I finish the current skein in the scarf, and at least 3 inches of knitting into the new one! 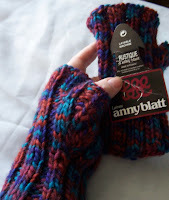 The Anny Blatt is bulkier, but it will still work with the worsted weight, as a trim. The wristlets are pretty simple, 32 stitches worked in a 2 X 2 rib, after 3 inches of ribbing, I ‘split a Knit rib’, (stitch 17, ) and made a lifted increase (making that rib K3) to start the thumb gusset. On succeeding alternate rounds, I continued to increase, either side of the lifted Knit stitch, till I had increased a total of 7 stitches- keeping, all the while, a single knit stitch as the center of the gusset, and working each new stitch in the established 2 X 2 rib pattern. The Knit rib I split before the thumb gussets was now 2 different ribs, with a set of purl stitches between them. Another 1½ inches of ribbing, and I bound off--in ribbing naturaly! To finish the thumb, I picked up 6 stitches (1 in the base of each of the stitches I cast on, and one in each ‘side’. Round 1, the 2 side stitches got knit together with one of the picked up stitches, (1 K2tog, 1 SSK) to bringing the stitch total to 11--knit mostly in 2 by 2 rib--the center thumb stitch remained a single knit stitch--as it had been during the time the gusset was being formed. 4 rows of ribbing were all that the thumb needed, before being bound off. From end to end, they only are 6 ½ inches, worked on size 9/5.5mm needles, one size smaller than the ball band suggests. PS You have got to visit Maritza blog--and the Tsock Tsarina's (link above) --both have wonderful (though very different!) entries today. The scarf is too long to drape on my ottoman--(the normal place for display)--so its folded, the white stitch marker (join point for a new ball of yarn) shows the progress. I still make a mistake or two--mostly forgetting to work the plain row of no twisted stitches. But-- I have a build in system to catch myself before I have gone to far. The twists stitches, as the pattern is written, aren’t simple twists, (Knit stitch 2, then knit stitch 1, then let both drop off needle. Rather they are , K2tog, then knit stitch 1, and conversely knit stitch 2, (through the back loop) then k2tog, (through the back loop) which results in the stitches in the left leaning chain being twisted, every other row. I prefer untwisted stitches, so on the plain knit row, I make a point of working the stitches that make up the Left leaning chains ‘backwards’ so the sit on the needle like this \\ (not like this //-- this way, I can work them with out stopping and doing a SSK type maneuver. A second advantage is, if I try to rush ahead, and work a pattern row, (skipping the plain row between) I quickly notice that the left leaning chain stitches haven’t been ‘turned’ -- and realize my mistake. 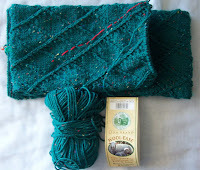 11PM update--skein 2 is finished,(50%) on to skein 3-! I am smart. (vain too, but smart) but sometimes I am a slow learner. By Jove, I’ve got it. Finally, I’ve got it! My foray into swatching inspired me to get cracking, and finish the Phyllotaxis scarf. Finally I have learned the ins and out of the pattern. I still need at this point to consult the graph, but I can ‘get it’ (understand what will happen to all 80 stitches in the row) with a glance. I hope at some point to learn it well enough that I don’t need to consult the graph at all. Some one asked me why I didn’t just give up on the pattern when I was having problems. Stubborn pride partly. I am sure I can, if I want, knit anything, from a technical point of view. And the pattern wasn’t so much hard as I wasn’t following or understanding what was needed, and why. I have designed patterns just as complex. With my own designs, I have often worked through 2 or 3 attempts before getting the pattern to be what I want it to be. I knit lots of hats, some are OK, but very often, a hat design is worked several times, before I end up with the design I envisioned. Sometimes, the experiments along the way are quite acceptable --and can stand on there own as successful designs. But they are not what I wanted-- they are successful failures! Each time I re-knit, learn something, and eventually, I get the final finished effect I want. Phyllotaxis is 2 row pattern. Round 1 is graphed, (80 stitches). Each round starts at a different point in the graph. You can see the how the Beginning of Round Marker moves with the pattern. EVERY ROW OF THE PATTERN IS THE SAME. How could I have not noticed this? A 80 Stitch, 20 row pattern is an intimidating undertaking. An 80 stitch pattern is a bit to learn, but it is quite do-able. Normal people can quickly master repetitive patterns, even large ones. If asked to sort the 52 cards in a deck into suites, and to organize each suite starting at 1 (the ace) and ending at the king, most 7 year olds would be up to the task. By age 10 or so, kids would be as fast as most adults. Humans are very good at creating and recognizing patterns. And then, there is me. A slow learner. 100 repetitions, before I realized the pattern. Maybe I am not so smart as I think I am. I haven’t knit since Friday. I just can’t muster the energy. Last night, to try and change my mood, I mad a swatch the Quellón chenille, to see how it worked up. This stuff wormed in the hank--so I went with the smaller needle size, (US 6) and cast on. Checking the gauge was part of my thinking, but which stitch to use was almost as important. I am going to wash (machine wash gentle, dry cool) to see how the yarn handle normal wear and tear, too. I made a second swatch, double knit , one side cotton, (Pehuén, another Araucania yarn) one side the Quellón chenille, since I was thinking how these yarns would make a lovely little vest for Granddaughter. I am, though, reluctant to burden her with high maintenance clothing. I want the finished garment to be relatively easy care. Her mother knits herself, and knows how to care for hand knits, but I remember ‘fancy clothing’ from my own childhood. I remember, wanting to be a kid, too, and getting in trouble for messing up the clothes. It’s not that I don’t knit fancy stuff for my grandchildren, it’s rather I often knit machine washable, easy care stuff. Wool is lovely to knit with… But poncho’s of Red Heart yarn are loved, and worn frequently, and thrown into washer and dryer and worn some more! There is never much of concern about them. Everyone ends up happy. It’s interesting how the swatches worked up.. The first swatch is 30 stitches and almost as many rows of the chenille. The firmest stitch gauge is not ribbing, or seed stitch, or even garter, but stocking knit! The chenille has no memory, and the back and forth movement of the yarn, that normally makes seed or ribbing tight, and elastic , instead adds ease. The double knit swatch, 12 stitches each side, is a bit looser, but it looks good. The Pehuén and Quellón yarns are very similar in color, making it hard to see the square with in the square design in the smaller double knit swatch.. But I like how it work up. This shows the chenille side, with a center square of the cotton boucle. The cotton square is just barely visible. Neither yarn is very warm, but a double knit vest, with air trapping layers would make a nice thermal vest. Warm enough to make mother happy, but comfortable to play in. I am knit out for the moment.. I just have lost my knitting mojo--its been replaced by a cooking one. Nothing special, just stock the freezer stuff: Stuffed shells, meatballs, seasoned rice, a bit of beef stew. Not frozen (and already half gone!) is a pot of old fashioned rice pudding. Another reason for the urge to cook was the cold. And it was cold. Inside and out. Last week, there was some basic service needed on the building boiler, and it was scheduled for 1 am. They had to turn the boiler off, so they could drain the water, do the maintenance, and get it back up to preasure -all of which, in the best of world, would be completed in an hour or so. Instead it took 3 hours, and with the wind (steady at 30 mph, with gust of 40 miles) and the artic temps that went along with the wind, the whole building got chilled. Technically it was below the legal limit-- NYC requires a min temp of 55 overnight, my apartment (I have one of those indoor/outdoor weather stations) recorded an over night low of 53indoors, (10(f) outdoors. 2 degrees below the legal limit is hardly enough to complain about, but normally the overnight low is about 10 degrees warmer. It really felt Sunday morning, and colder still Monday --after the midnight maintanance. All my windows were closed (which actually unusual) but my apartment it remained cool during the day. There are drafts--the windows themselves are double glazed, but there are gaps between the window frame and building structure, and there is weather striping on the terrace door, but again, its far from tight. Normal, I like this --I like the fresh air, but it took all week before it was comfortable warm. Well warm enough to sit and knit. Instead I moved around, cut up vegetables, boiled water for cooking, and general found myself in the kitchen, next to a warm oven! Progress on the phyllotaxis is slow--I made yet an other mistake, and this pattern is very intolerant of mistakes! At least I know what I am doing, and was able to tink to rounds, not frog rounds to get back on track. I see the pattern now, and see when I have made a mistake.. Which is some progress I guess! 2 full repeats of the pattern completed, perfectly. It is a deceptively complex pattern, with 3 separate elements. The design seems to be a set of chains (simple crossed stitches) that form diamonds shapes. There are 5 left leaning chains; each created with set of double twisted stitches, (these twisted stitches lengthen one edge of the pattern) and the ‘chained line’ element of this part of the design is an unbroken line. There are 8 right leaning chains which at first appear to be the same, but in reality, are ‘broken’ every time the cross (under) the left leaning chains--a subtle element that is not immediately evident! At first glance, the pattern seems very similar to a cabled diamond, but it is in reality, the design is not made from diamond shapes at all, but from parallelograms. Unlike a diamond pattern (argyles for example) the diamonds spiral--in fact the whole pattern spirals, moving 10 stitches to the left ever pattern repeat. But this pattern has all the diamonds on a diagonal arc -- every other row starts/completes another parallelogram! All in all, complex, engaging pattern! Hard enough, that I wasn’t able to get it in one go, so it challenged and intrigued me. But not so hard that it is beyond my comprehension! 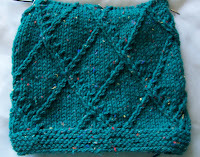 Still an 80 stitch 20 row pattern is one of the largest I have worked on! 2 repeats equal about 8 inches--for a finished scarf of 60 or so inches, I have another dozen or repeats to go! I had hoped to be photographing and showing off a good 14 inches of my phyllotaxis scarf today.. I might have been able to, if hadn’t frogged it back to the garters stitch border yesterday! Honestly, I don’t know what is wrong with me and this pattern! I keep learning and understanding the pattern better (or so I claim!) but I keep messing up! Yesterday, I didn’t complete a single pattern repeat. Actually, it's fun. It’s not that hard a pattern, I just haven’t been paying the attention to it that I should, and it does need some attention paid. Each time I start again, I learn more of the underlying logic of the pattern, and it becomes more interesting. I am so used to picking up patterns/knitting and working almost without thought, it’s fun to work on a pattern that doesn’t fit into my assumptions, and makes me stop, take notice and to think about what I am doing, that I am enjoying the process, even as I make mistake after mistake!